"Aaron's Pet"™ healthy aquarium frozen fish food diet. 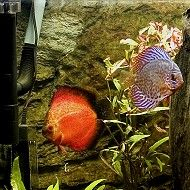 Here is the most recent video of the tank and Piranha, after eating Omni-Diet since fry-dom. Thanks to all our customers who continue to purchase "Aaron's Pet" brand foods! Notice the fishes color difference between this third video and our first.